How sholud we understand this, that 'the universal Church had at all times manifested faith in the bodily Assumption' while on the other side, as You say, there are no real references from first 3 or 4 centuries? It means what I said in the article - the Church implicitly believed in the Assumption even if the dogma was not worked out yet, just like she implicitly believed in the Hypostatic Union well before the dogmatic definitions, since all the dogmas of faith are united organically. For example, the Church always "believed" in the efficacy of indulgences, which began in the 3rd century but were implicit in the teaching on the necessity of doing penance. I don't think the Pope's statement means that there is a clear line of written testimonies of belief in the Assumption going right back to the beginning, because even in his Bull proclaiming the dogma he does not cite any sources earlier than the early 5th century. I believe in the Assumption of the Blessed Virgin Mary because it was revealed by God, who can neither deceive nor be deceived. This is how we must believe as Catholics. It is fine to examine the history of the dogma, or motives for credibility. However, it seems to me that you are operating on human faith, rather than divine and Catholic faith. Be careful about that. It's Protestant! Absolutely, but if it is revealed, then it is right to ask how? Is it something found in the Scriptures? Do we see it in Tradition? I am actually arguing with what you are saying. We do not believe the Assumption because of arguments from history, but because it is part of revelation as inferred by Mary's sinlessness. I don't think there is anything Protestant about inquiring where in Divine Revelation certain dogmas are found. This is an excellent answer to the question I posed on your blog some while ago. Very useful in apologetics. P.S. what happened to that post on Judaism, I was looking for that diagram of OT feasts? Hmmm...try scrolling down the sidebar to the bottom and clicking the "Jews" tag. I didn't delete it, so it should still be up here. 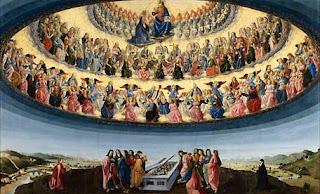 The infallible teaching of the Roman Cathiolic Church is that the dogma of the Assumption is formally revealed, albeit implicitly. This is not the same as a theologocal conclusion; which is an inference arrived at by means of a revealed premise, and a premise of human reason, from which one infers a conclusion. Your article insinuates that this dogma "de fide Catholica definita," is merely a theological conclusion. If that were the case, the dogma of Mary's Assumption could not be believed by Divine and Catholic faith - but merely ecclesiastical faith - which is heresy. Please explain. I was not denying it was formally revealed. When I said it was a "conclusion", I only meant to deny it was based on historical testimony. I was not using the phrase "theological conclusion" in the formal sense. I will see if I can rework this to make it clearer. Okay Carl, I have reworked it. Would you mind reading it again? I have removed all the words about it being a "conclusion" or "deduced" and replaced them with saying it is "implied" and 'inferred" from, and made more explicit that the dogma is part of divine revelation. Your redaction is welcome and appreciated. "It means what I said in the article - the Church implicitly believed in the Assumption even if the dogma was not worked out yet, just like she implicitly believed in the Hypostatic Union well before the dogmatic definitions, since all the dogmas of faith are united organically." To take a deliberately ridiculous example, just for the sake of illustration: how do we know that in 10,000 AD (looking ahead a bit) there will not be a definition of the divinity of Harry Potter ? The arguments for the divinity of Harry Potter may well be very impressive - the HP books are wildly popular, and a lot of us in the CC like them. Saints no more fabulous have been canonised - like St. Ursula of Cologne. I can easily imagine the canonisation of St Harry Potter, millennia hence, on the grounds of immemorial cultus - but that will not make him anything more the invention of a gifted authoress. But none of us will be around to blow the gaffe by pointing out that he has no more historical reality than Bilbo Baggins. And anything could happen in the next 8,000 years to make this ridiculous idea seem plausible. But it will be false - it will just not be possible to say the Church has always believed it - even if one means the Church believed it implicitly. Granted, I'm conflating definition of dogma with canonisation of Saints, but the point remains: one cannot simply attribute the beliefs of today to the past, as though the generations had held them. Not if there is no evidence of such belief in the past, and the only reason for such an attribute is a need to show that a belief is Apostolic. I find this very troubling, because the Church is not entitled to try to create history - if belief X cannot be shown to have been held at all times, it should not be said to have been held at all times. That is surely basic honesty. The requirements of dogmatics cannot be allowed to bulldoze the realities of history, so far as these can be ascertained. Just for the record, I believe the Assumption of the BVM to be a real fact & an Act of God - IOW, that it is as the Church has defined. I am not going to answer you point by point here, but I recommend you read Cardinal Newman's Essay on the Develpment of Dogma. We do indeed read the past based on what it turned into. It is not necessary that every doctrine be worked out and believed in its explicit detail; it is enough that the kernels are there, in which the doctrine rests implicitly. This is the Catholic understanding of how dogma develops. Read Newman. Thanks - I have read it. I totally agree w/ your point that the Assumption is a reality, but not historical. The "Essay" leaves a lot of issues untouched - the quoting of Fathers, though it has its uses, is of limited value. Well, I don't deny the Assumption is 'historical', but I do deny that the reason we believe it is because of historical proofs. "There may be truths, then, contained in the Deposit of Faith which have not always nor everywhere been sufficiently known and proposed to the Faithful as a part of the faith. We might expect this, especially in the beginning of the Church. Add the political turmoil of the times, the persecutions, the unrest, and it becomes evident that an explicit belief about all elements of the Faith in all times and places was a moral impossibility."